In a recent tweet, Erik Larson, author of the acclaimed The Devil in the White City and the recently released and nearly as good Dead Wake (on which I’ll have more to say in time) paid tribute to his yellow writing pad and his well-sharpened pencils. I pictured him sitting at a cluttered desk with a pad open before him and a ready stack of pencils, and it encouraged me to step away from my computer and to attempt to write using a yellow pad and a pen. I find that doing so does effect the way I write. When writing on paper my posture is more alert. I write more slowly, perhaps but not necessarily more thoughtfully. It is not as easy to correct a word or a sentence or to re-order paragraphs and so I think I’m a bit more careful. Knowing that I will edit the whole as I bring it to final form on a computer may counteract these advantages, and yet being forced to rewrite the whole as I type is a good discipline in itself. I find it humorous if not disconcerting that when I begin to write with pen and paper after not having done so for a time, I cannot control the impulse to look at the top right-hand corner of my pad to see what time it is. Perhaps to quell such impulses as that makes the occasional yellow-pad writing worthwhile. So, occasionally I’ll revert to the pad. But I’m guessing this is true of Larson as well. He has mentioned elsewhere other tools without which he could not write: his laptop and a stack of Double Stuf Oreo cookies. I’m reminded of the comments of Neil Postman (in Building a Bridge to the 18th Century) regarding the perceived advantages of technology in writing. It’s ironic then that I’ve consumed more than 500 words talking about the technologies of writing and not writing about things that matter. I’m guilty of his observations. Postman’s final judgment is that the net gain of our technologies of communication is “about zero, with maybe a two- or three-yard loss.” He’s probably correct. Sticking with the football metaphor, I have no illusion that throwing the exact same football as Peyton Manning will qualify me to run an NFL offense. But as one who wants to write but rarely does, the tools that help accomplished writers intrigue me. Therefore, I’m buying some Oreos. Today. Is That a Geek in That Chair? Yes, and a lazy one at that. I began reading Is That a Fish in Your Ear? : Translation and the Meaning of Everything quoted in my previous post while seated at Starbucks. What does one do to access the quotes he wants to share when the only thing within reach is a venti caramel latte (yes, I was splurging)? Turns out that there is an app for that. The quotes I shared were lifted from the page using a free app called ImageToText. From within the app I snapped a picture of the text I was interested in. The app converted the image to text and sent it to my Evernote account (also free). That was Saturday. Today, I opened Evernote on my computer, cut and pasted the converted text, edited out the few idiosyncrasies I would expect from a free OCR app, and pasted the results. Earlier today I made a comment at Justin Taylor’s site praising Scrivener as a tool for sermon preparation and directed people here to find a way to contact me. I was rushed, and so people were left with the impression that I was saying that there was something on the blog here that would answer their questions regarding how I USE Scrivener. Sorry for that! So, while we wait Mr. Taylor’s moderation, I will re-post my comments here. I don’t know why I did not think of that sooner. And some day I want to expand this. The context involves using Scrivener for sermon preparation. To that end I offered my sermon prep templates to all who wanted them. So, here they are. If I had time, I’d tell you how I use these – perhaps on my blog at some point. But for now, here are the templates, one for s sermon series (I currently have close to 60 sermons all stored in a single project for my series through John) and the other for a single series. It is great for keeping the sermon research all orderly. And with the clippings feature, when I see something online that will fit a current or upcoming sermon, I clip it and keep it until I need it. I could gush without end. In any event, hope these are helpful. And, for newbies, the Scrivener tutorials are extremely well done and give enough to get one well started. There you go. Wish it could be prettier! Hope it is helpful to many. Happy to answer questions. Let me know if you are still having trouble. UPDATE: Okay, those did not work. Instead, download the following, unzip it, and open it in Scrivener. Then if you want to make use of it, chose ‘save as template’. It includes only the sermon series template, but that is what I use most often. 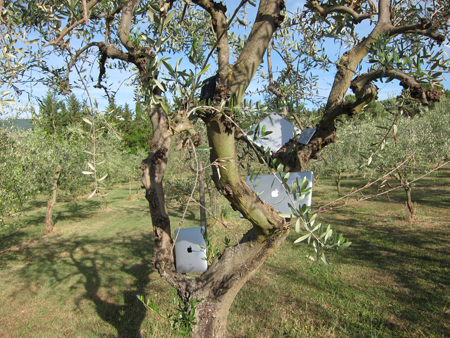 We recently discovered where Macs are made: they grow on Apple trees, of course. Intel and picture courtesy of Bruji. I started my Twitter experience as @rg7878, according to my profile, on October 14, 2008. Must have been a boring day. Curiosity mixed with a dose of ADD drove me to sign up. The same keeps me coming back. I recently renewed an exploration of Twitter, at the impetus indirectly of @andejohnson and @frailestthing, and am finding again the problem I’ve found every time: I cannot say ANYTHING worth saying in 140 characters or less. Brevity is a virtue, the soul of wit, they say. And I’m a big fan of Strunk’s rule #17: Omit needless words. And yet, as with most virtues, this one just seems out of my reach. But if you still want to follow my aimless wanderings in the Twitter universe, I’d love to have you. It would be tweet of you to follow me. I was pondering the other day the value of e-books as all 1691 grams (about 3 3/4 pounds) of Stephen King’s Under the Dome pressed heavily upon my chest in bed. Those familiar with Mortimer Adler (How to Read a Book ) will know that reading while reclined breaks one of Professor Adler’s fundamental rules of reading. Those familiar with Stephen King will know that his aren’t the kinds of books that Professor Adler was concerned about me learning to read, so that’s all good. At present, annotating an e-book with a stylus is about as handy as marking up a Norton anthology with a Crayola. The amount of clicking required to two-finger type a note using the Kindle’s mini keyboard is even worse. But for most everything else, I’m sticking with a paper book and a pencil. 1. Cajole 26 year-old son into giving you an unused powered sub-woofer. 2. Set sub-woofer next to audio system for seven months. 3. Move to different city. 4. NOT connecting sub-woofer to receiver saved having to disconnect for move. Make note of brilliant foresight. 5. Set sub-woofer next to audio system for another seven months. 6. NOT connecting sub-woofer to receiver sets baseline audio quality so that women-folk are prepared to be impressed upon connection. Make note of brilliant strategy. 7. Plug sub-woofer in to power source. 8. Connect sub-woofer to receiver using suitable RCA cable. 9. Crank up Lord of the Rings: The Return of the King in DVD player. 10. Eat some potato chips while pondering still silent sub-woofer. 11. Move cables around on back of receiver. Push random buttons on front of receiver. 12. Eat more chips. Pound top of sub-woofer. 13. Ask wife where receiver manual might be found. She knows, of course. Add crow to chips. Get manual. Womenfolk have yet to be impressed. 15. Change to “Sub-woofer: On”. Feel pulse rising. 16. Discover “Double-bass” setting. Turn it to “ON” of course. 17. Excitedly resume movie. Sadly note silent sub-woofer. Note cable plugged into wrong spot. Move cable. 18. Hear sub-woofer rumble. Look at ten year-old son with that “isn’t that cool” look. 19. Watch “I-Am-No-Man” Eowyn slay the Nazgul at top volume, no longer caring if womenfolk are impressed. 20. Cheer wildly. For multiple reasons. My son and I got 1 minute and 36 seconds of enjoyment out of this. Thought you might as well. Tinkers , reviewed here yesterday, was the first book I’ve ever read completely on an electronic reading device. Shortly after getting my first ‘smart phone’, an iPhone, this summer, I was shown that I could get a Kindle App for use on the iPhone which opened up to me Amazon’s collection of ebooks, a collection both more extensive and less expensive than that available for the the more elegant iBook app pre-installed on the iPhone. Though I immediately bought Tinkers which had recently been recommended to me, and a couple of others, I have resisted reading in that format. Now that I’ve done it, a couple of thoughts. 1) The reading experience was good. After a while, I did not miss the smell of pages and the physical feel of the book in my hands. Once the content took over, the delivery system was not missed. 2) I loved being able to read at night without turning on the light. I found that I could hold the phone and ‘turn’ the pages adeptly with one hand even while lying in bed. 3) I find that I can always have a book at hand. The iPhone is light, fits in my pocket, and goes with me everywhere. (I can’t see what the advantage of the Kindle itself would be over the iPhone for delivering this content.) My pride takes a hit, though. If I’m sitting somewhere waiting for someone, and am staring at my phone, I’d rather people know I’m reading a good book rather than playing “Angry Birds”! 4) On the other hand, I tried to mark passages in Tinkers. It was simply not as quick and easy as with a paper book. 5) And the reason that I cannot see myself ever moving to this method other than for the occasional book is the loss of the library. When I’ve read a book that mattered to me, I like to put it on the shelf. There it lives next to other books which have been a part of my life. At will I can pull it down, flip through some pages, find a passage. I can pick it up and hand it to a friend for them to look at. I’m emotionally bonded to the paper and ink in a way that I never will be to the 1s and 0s. Ebooks are a great tool. I would gladly receive a Kindle gift certificate any day – for, say, Christmas… :-). But I cannot see it ever surpassing the love affair I have with the hold in your hand variety of books.